Bekhero milk is created using state-of-the-art technologies and high quality ingredients that effectively maintain the nutritional value of liquid milk. When introduced to the market, it was the first of its kind and designed to target those who have been traditionally averse to packaged milk due to factors such as cost and unfamiliarity. 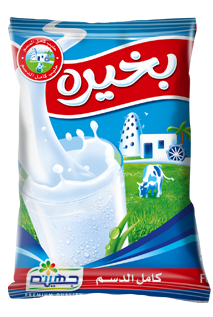 The development of our Bekhero line was one of many initiatives that we have taken so far to deter the health-risks associated with consuming loose milk; a practice that continues amongst many Egyptians today. Available in full cream and a sweetened alternative, our Bekhero milk line is both affordable and full of the nutritional requirements needed by the market segment that it targets. Our Bekhero Full Cream Milk has a high concentration of vitamins and minerals that are fused into a rich and creamy taste. Available in 1 liter, 1/2 liter and 200 ml packaging, the full cream products have a shelf life of 3 months since the date of production.